We’re back again with another Community Collection spotlight, and this time we’re featuring artist Ástor Alexander. With impressive work in and outside of video games, chances are you’ve seen the artist’s renditions before. Alexander is a California-based illustrator that uses a unique noir style to portray games and characters like those in classic pulp fiction covers. 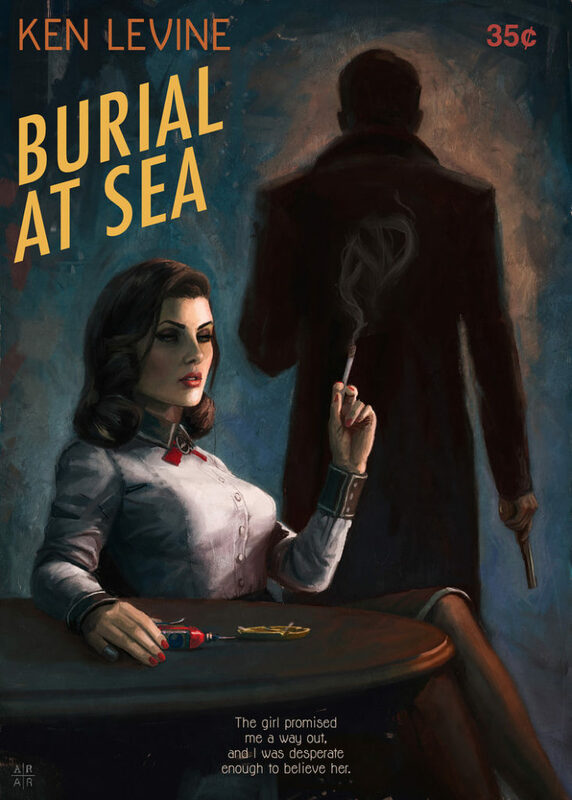 We were really excited when Ástor Alexander agreed to work with us to bring the ’50s crime novel-inspired Burial at Sea – Paperback artwork to the community. Follow the link below to pick up your own poster and check out our interview with the artist. Ástor Alexander’s Burial at Sea – Paperback is available as a thick-stock premium matte poster in our online store. As part of our Community Collection, a share of the purchase price of each art piece sold goes directly to Ástor Alexander. Poster price is not as marked – the old-timey “35¢” is part of the artist’s pulp cover theme. I grew up in Ensenada, Baja. My first fan-art drawing was either one of the Power Rangers or Goku. That was when I was 5. My first video game console was a Sega Genesis, it was an Xmas gift. I moved to San Diego in 2007. Dropped out of community college in 2009 and started working as a freelance painter and illustrator. I stopped painting (with real paint and canvas) some years ago, but I plan to go back to that in the future. BioShock (2007) IS my favorite game, Infinite might be second. So when Booker and Liz went to Rapture, I thought it was time to (digitally) paint something. Do you have a favorite memory or turning point in the series? I have very clear memories of my first visits to Rapture and Columbia, getting to those lighthouses and having those cities revealed to me thru the bathysphere and rocket’s window. Oh, and that time I sh*t my pants after I picked the plasmid in the dentist’s office. But the Andrew Ryan confrontation might be my favorite. 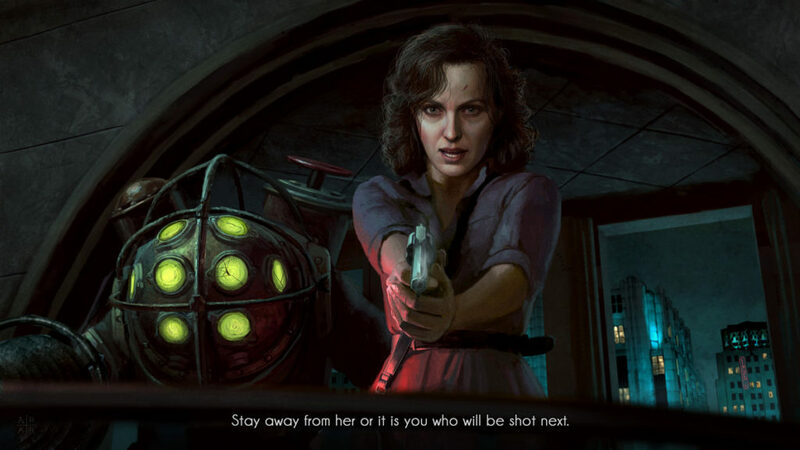 What was your inspiration for drawing Elizabeth and Burial at Sea? If you look at the rest of my work, you’ll see I have a thing for femme fatales. 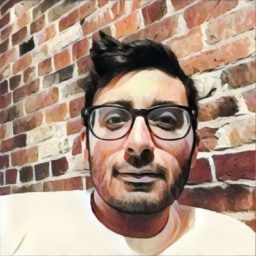 Were there any themes you were trying to pursue? Hmmmmmm… I don’t think so. She inspires more fear than god. James Avati, Adam Hughes, Caravaggio, Norman Rockwell, Robert Maguire and a lot more whose names I don’t remember right now. For fan art, I spend some time thinking of pop culture icons and how I can reimagine them. Once I find a nice idea, I sketch the images in my head. Then I compose the image using a program called Sweet Home 3D, and then I take reference photos (for the dudes, I take photos of myself). And then I spend a week or so painting and repainting. For commission work, it’s the same except for the first part; I don’t have to come up with the concept. Among your expansive collection of works, you have also drawn Big Daddy and Tenenbaum. Are there any other characters you would like to or plan to use next? My favorite BioShock character is Rapture, and I’ve wanted to paint it for a while, but I’m not good at painting cities. So…I guess Andrew Ryan could be next. I’m playing Witcher 3 now that my new iMac can handle it with mods. And I’m playing Stormbound on my phone—haven’t made it past Rank 25. I have Shadow of Mordor and Wolfenstein 2 in my waiting list. (I made some official illustrations for Wolf 2, btw). I really want to play Lone Echo, but I don’t have a VR headset. Want to read more? Check out our previous Community Collection Spotlight’s on Bona Kim and Kisu-No-Hi!